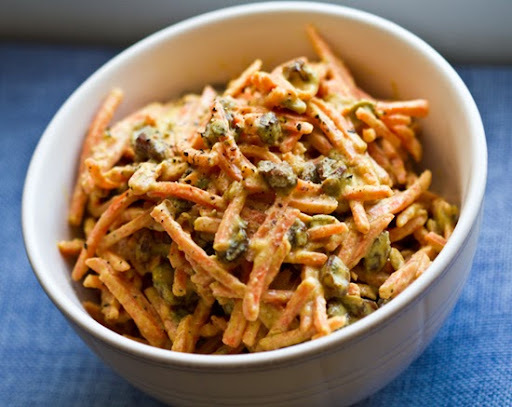 Easy Tahini Curried Carrot Salad. Spicy-Sweet. 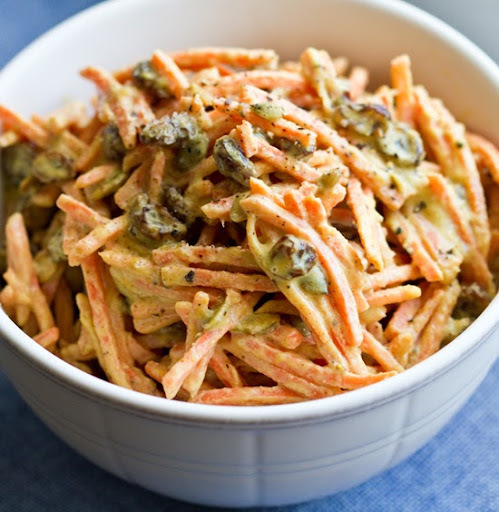 My Tahini Curried Carrot Salad is a quick and easy recipe - delicious for lunch, dinner or heck, even breakfast! 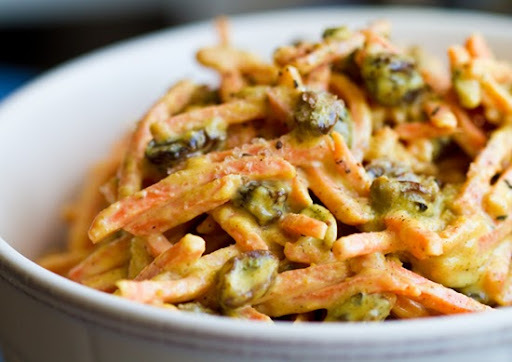 The sweet crunchy flavor of matchstick carrots mingles with the bitter-creamy tahini dressing, plump raisins, crunchy pumpkin seeds and spicy-savory Muchi Curry. Salad for One. I planned and plotted to make this salad for myself, for lunch, during my workday - while my husband was out of the house. Why the secrecy, you ask? Well at first glance, this recipe contains all things my husband hates: carrots, raisins and curry. Gosh, sometimes it feels like I'm the vegan, yet less picky than he is. Ha! I whipped up the salad and gave it a taste. Bliss! I loved it. Crunchy, cool, creamy, spicy and fragrant. ..Since I was dining alone, I had the entire salad bowl to myself. Dive in Kathy! But mid each zesty-yummy bite, I kept thinking: "I have to get my husband to try this!" Sometimes even foods you think you despise can taste good when presented in a new light. Like my Green Bean Fries. ..and with each new ingredient you taste - you might hate it or love it, but at least you tried it! I never want to stop trying new and exotic foods and finding new favorites like: rambutan, cherimoya, nutritional yeast, grade B maple syrup or kombucha. Raisin-phobic? I know some people can't get past raisins - raisin haters are incorrigible (like Garfield). 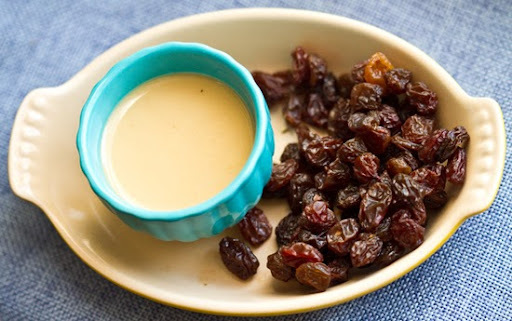 Try substituting raisins with chopped dates, dried cranberries, juicy golden (less scary) raisins. Or simply add in fresh chopped fruit like apples, citrus, canned mandarins or pears. 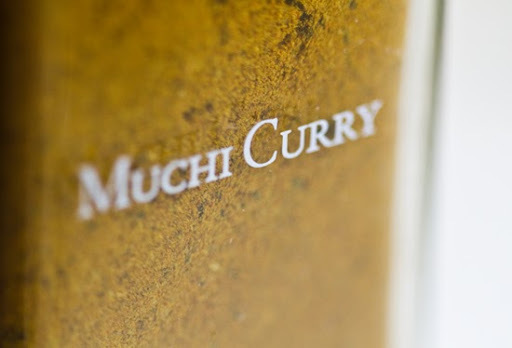 I used a Muchi Curry from Whole Foods. It has a musty, spicy, warm flavor. When buying spices, I try not to skimp on quality - it can make or break my dish. 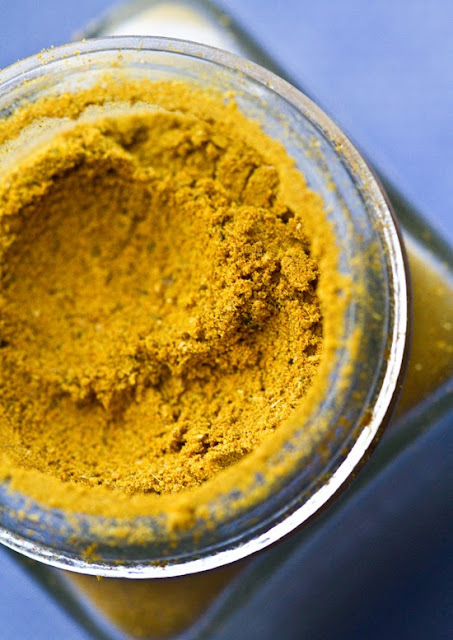 A good spice is a useful 'recipe investment'. One bottle goes a long way - endless recipe possibilities! I used a basic organic tahini - ground sesame seeds. It has a 'watery peanut butter' texture. The maple syrup in this dish balances out the slightly bitter tahini taste. Tahini is a great way to achieve creamy, yet vegan, salads. 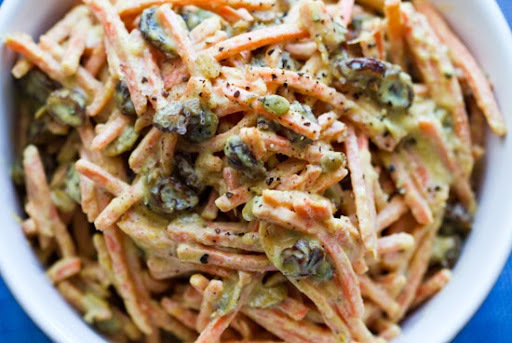 Also try my Seedy Tahini Cole Slaw. Side Salad -> Meal! Add pan-fried or baked tofu (a citrus or maple sweet marinade would be nice) to this salad to make it a meal. You could also toss in walnuts, white beans or garbanzo beans to add more protein and fiber. 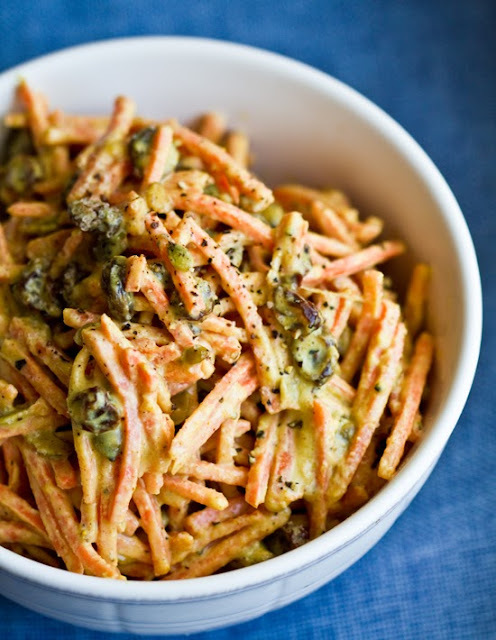 Citrus orange slices or mandarins would also be a fun toss-in to this recipe. 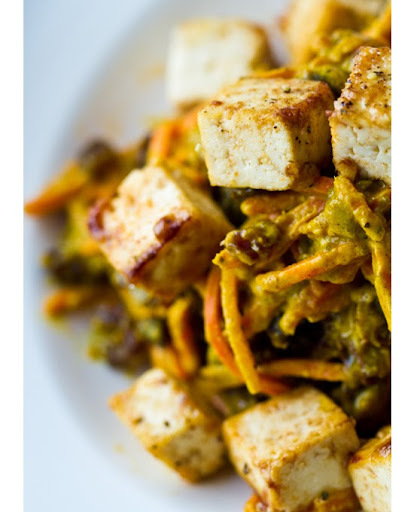 ..the ginger tofu cubes were sauteed in olive oil and marinated with powdered ginger, lemon juice, maple syrup and a touch of sea salt. 1. 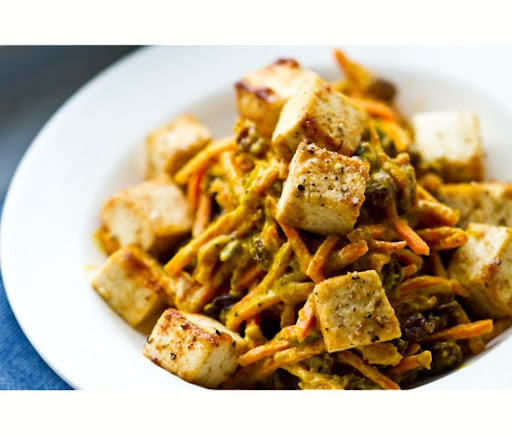 In a small bowl, combine the tahini, lemon juice, maple syrup, curry powder, black pepper, salt and garlic powder. Whisk well. 2. 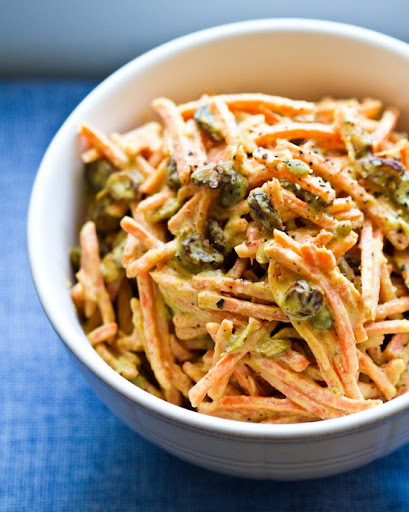 In a large mixing bowl add the carrots, raisins and pumpkin seeds. 3. Pour the dressing mixture over the carrot mixture. Toss well until all the ingredients are well coated. Pour into serving bowl to set. 4. Allow to marinate in the fridge for at least an hour. Serve chilled.